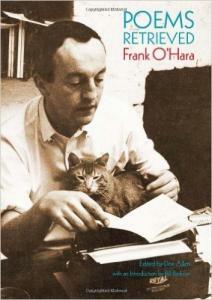 Born in Baltimore, Maryland, and raised in Grafton, Massachusetts, Frank O'Hara served in the U.S. Navy in the South Pacific from 1944-1946. He was educated at Harvard and the University of Michigan, after which he served as associate curator at New York's Museum of Modern Art and editor of Art News. 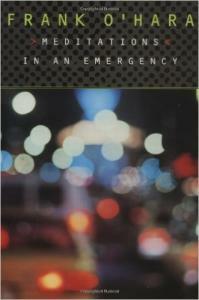 Like John Ashbery, a friend and member of what came to be known as the New York School of poets, O'Hara mixes high and low cultural allusions with a certain effortless glee; he also manages abrupt shifts of tone that mimic the erratic, associational paths of a consciousness stimulated by external events and images. The poems skate easily over surfaces, light on objects, absorb variations in mood, and register the cultural and political temper of the times with a grace that makes them immensely pleasurable, but an oblique sense of tragedy also gives them a haunting gravity. As with the abstract expressionist and action painters he admired, O'Hara's poems are also chronicles of the process of their composition. 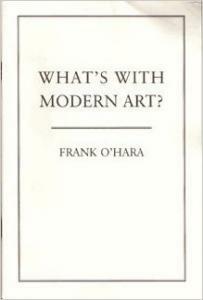 He was often casual about his output, sometimes not even keeping copies of his poems; O'Hara's work survives today in part because he sent poems to friends that were later collected posthumously. Widely imitated, his voice remains exceptional. He was accidentally run over and killed by a jeep on New York's Fire Island. 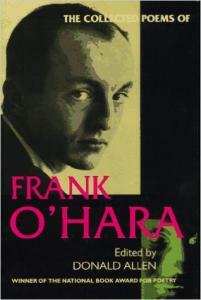 Frank O’Hara’s writing has an air of whimsy to it, for he felt that writing was something one must innately feel and write spontaneously. His style is relaxed and casual, yet still complicated and intricate. It has been said that he did not even keep copies of his work and many of his works were later published after his death because his friends or family had copies. 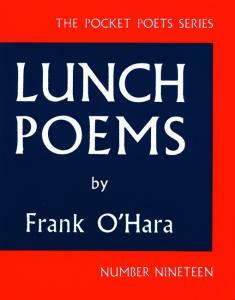 He would write when inspiration hit; his work Lunch Poems was written while he ate lunch. He was not only a poet but also an art critic. He found himself unraveled by artistry in its many forms: music, language, art—all collided together to form some of O’Hara’s masterpieces. His poetry has a hint of self-reflection. 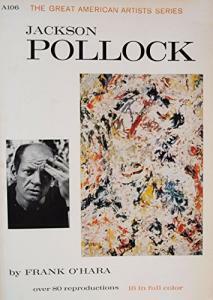 He wrote a few works with artists, such as Jackson Pollock when they collaborated to write a Pollock biography, Jackson Pollock. He also collaborated with artists to write In Memory of my Feelings: Selection of Poems and Art Chronicles 1954-1966, which features members of the Abstract Art movement. His projects with artists has created influential work that will continue to spark interest to many for years. His innate interest in the lives and creations around him force his readers to open their eyes to more than poetry and language but to the meaning of one’s connection to another. Chase Dimock: On "A True Account of Talking to the Sun on Fire Island"
Neal Bowers: On "A Step Away from Them"
Brad Gooch: On "A Step Away from Them"
Marjorie Perloff: On "A Step Away from Them"
John Lowney: On "A Step Away from Them"
Hazel Smith: On "A Step Away from Them"
Hazel Smith: On "Why I Am Not A Painter"
Robert von Hallberg: On "The Day Lady Died"
Brad Gooch: On "On Seeing Larry Rivers' Washington Crossing the Delaware at the Museum of Modern Art"
Marjorie Perloff: On "On Seeing Larry Rivers' Washington Crossing the Delaware at the Museum of Modern Art"
David Lehman: On "On Seeing Larry Rivers' Washington Crossing the Delaware at the Museum of Modern Art"
Hazel Smith: On "On Seeing Larry Rivers' Washington Crossing the Delaware at the Museum of Modern Art"